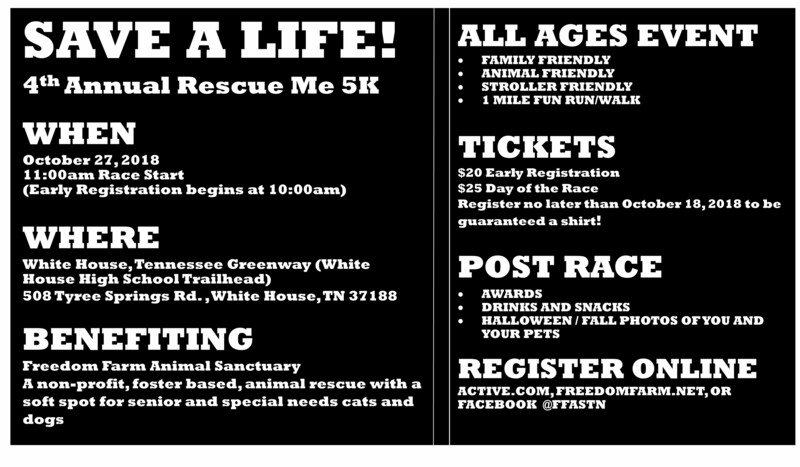 This is an animal friendly, family friendly, 5K and one mile walk/run to raise money for Freedom Farm Animal Sanctuary! This is an extremely fun event for serious runners and those wishing to get out and have fun with like-minded, animal friendly folks! Registration begins at 10:00am and the race starts at 11:00 am. Snacks and drinks will be provided post-race. We would love to see you AND your furry friend in costume! Prizes will be awarded for various categories of those in costume. Freedom Farm Animal Sanctuary is a small, foster based, no kill, non-profit, animal rescue in Middle Tennessee. The volunteers and board members take pride in providing second chances to cats and dogs that may be older or have significant medical issues. By donating to Freedom Farm or participating in fundraising events like this, YOU play a direct role in helping provide second chances to these cats and dogs! Click link below to sign up for this fun event!